Investment Idea: $100 invested in 222 Forever Stamps. Extra Costs: The total cost of this investment was actually only $99.90 (222 Forever Stamps at $.45 each) so to make it a solid $100 investment, I have included an extra $.10 to be stored with the rest of this investment. Total Time Spent on Investment: 10 minutes driving to post office. 10 minutes waiting on line. 5 minutes for total transaction. To make this investment all I needed to do was head to the local post office. Unfortunately, due to budget cuts and scale backs, the only time I could actually go to the post office was during the morning on a Saturday. Once I got there I waited on line and was helped rather quickly. I asked the clerk if he sold Forever Stamps, and in reply he said, “Oh boy do we!” I then asked him how much a Forever Stamp was: “45 cents,” was his reply. I took out my phone and divided 100 by .45 and ended up with 222.22 repeating. Since you can’t buy a partial Forever Stamp, I then asked the clerk for 222 of them. This didn’t really seem to phase him and he proceeded to take out two rolls of 100 stamps each, one sheet of 20 stamps, and then two solo stamps. He placed them on his scale and rang up the total of $99.90. (Post Office receipt)After returning home I needed to make this investment an even $100, so I also took a dime and placed it with this investment. The idea for this investment came from a lot of places. I think the allure of something lasting forever is what really sold me on it: the fact that you could spend money today and hedge your risk against all future risks and problems the world might throw at you. The Forever Stamp, which went on sale starting back in April, 2007, initially cost only 41 cents. * It now costs 45 cents and doesn’t seem like it will cost any less soon. These stamps come with the promise that they can be used forever and will always be good for mailing a first class letter weighing up to one ounce, even if normal postage rates increase. The main problem with this hedge, though, is that the Post Office does not raise the price of stamps without due notice. So, anyone can bandwagon onto this investment the day before the price increase and gain the same benefits I am hoping to gain. However, if current trends continue, we are almost guaranteed to see the price of stamps rise over the next two years. If it raises at least two cents a stamp I am looking at a solid 5% return on them. But this does not account for the lost chances I had if I had spent the $100 on a different investment while waiting for the Post General Master to announce another round of postage increases. Hopefully, the return on this investment in Forever Stamps is the post office continues to go over budget and lose money. In response, they increase the cost of stamps. This makes the price I paid for them cheaper than the amount they would then cost. This has already happened as recently as January 22, 2012. 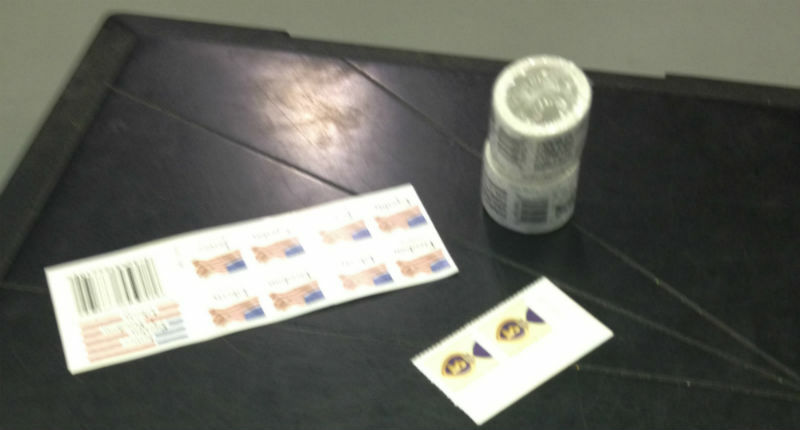 Back in January the cost of a stamp increased by one cent to 45 cents total. 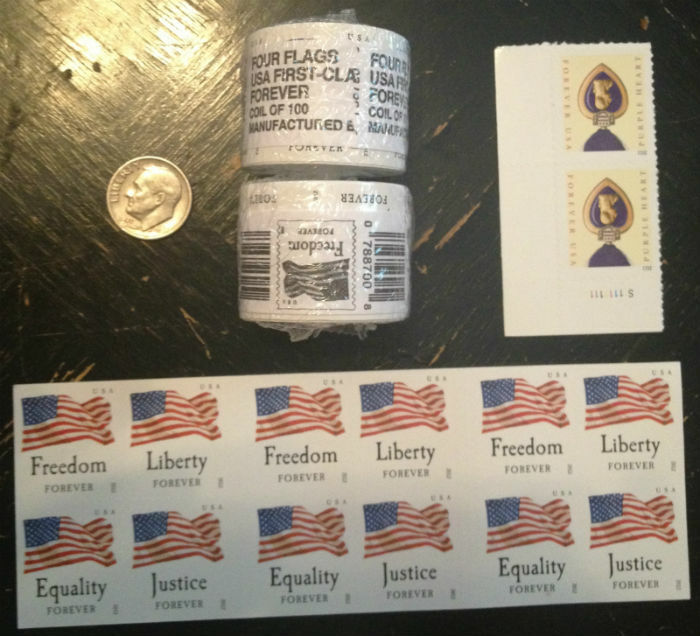 Since the creation of Forever Stamps in April 2007, the cost has risen by four cents, almost a penny a year. 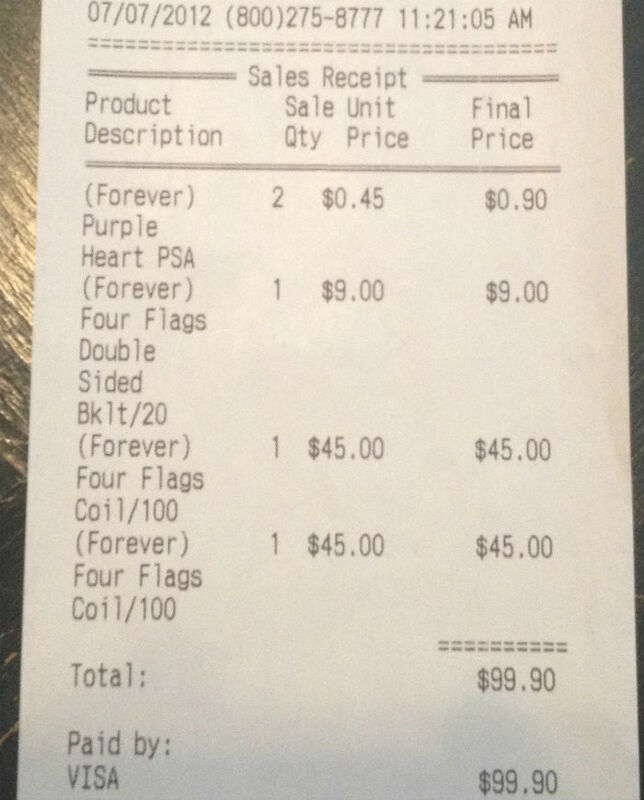 If you had purchased $100 worth of Forever Stamps back in April 2007, at 41 cents each (for a total of 243 Forever Stamps and 0.37 Cents left over that investment), they would now be worth $109.72 (243 * .45 + 0.37) for a total return of 9.72% over slightly more than five years. This is an annualized return of 1.8%. * My hope for this investment is that this trend keeps up. I do realize that I don’t look at costs of investing that money in a better place and then buying the stamps directly before an increase, which would be the best strategy for making gains on Forever Stamps. Another problem to note is the exit strategy for this investment. It is not very convenient or easy to sell stamps and make money off of them, or the post office would be in a lot better shape. 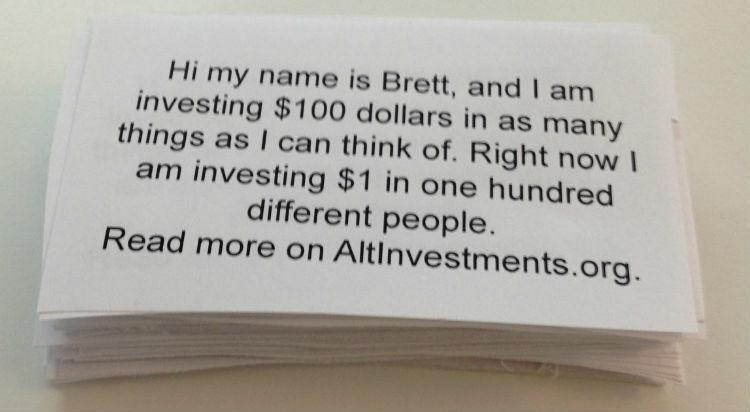 Investment Idea: $100 dollars in $1 bills handed out to 100 random people. Total Time Spent on Investment: 10 minutes of prep work. 20 minutes of handing out dollars. I have always felt that there is an underlying connectedness between all people. By helping other people you can help yourself too. My favorite TV show for years has been My Name is Earl, and his mantra of “do good things and good things happen” has always seemed like a great way to live your life. In that spirit I decided I wanted to take my first $100 investment and break it into $1 bills to hand out to one hundred random people on the streets of New York City. Who couldn’t use an extra dollar in their lives? To explain why I’m doing what I’m doing, I decided I needed to attach some sort of note to the dollars. 1. I needed cards, so I Googled free online business card maker and found Avery. All it requires for you to sign up with it is an email account. I used a fake one and it went fine. Avery is pretty great. You can choose lots of patterns, styles and looks for any type of office. I choose basic cards that could fit ten to a page. It then exports your document as a PDF, which you can print using any printer. 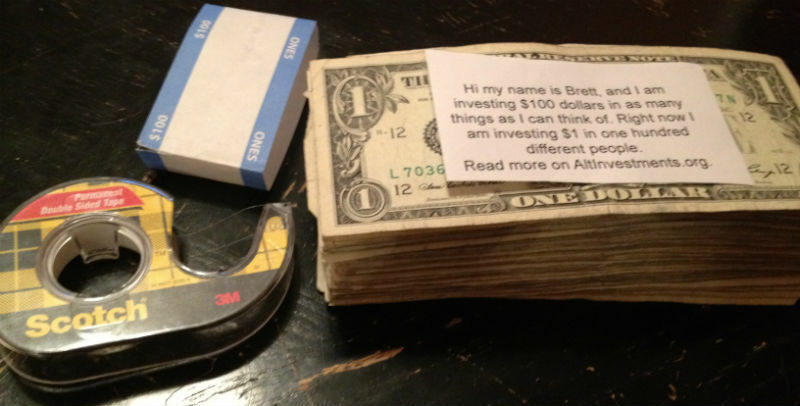 Hi my name is Brett, and I am investing $100 dollars in as many things as I can think of. Right now I am investing $1 in one hundred different people. (Cut out cards)Next I then went to my local bank and withdrew a $100 in single dollar bills. ($100 in singles)After I got home that night I applied the cut out cards to the dollars using simple double sided tape, and was done. My parents and most Hollywood movies have taught me one thing: have faith and believe in other people. With that said, I decided to take it a step further and invest in other people, even if they don’t know I am investing in them. I chose to hand out my first investment and hopefully get some good karma and free PR out of it. If I gave you a dollar today please enjoy it and spend it on something you wouldn’t normally buy. Use it to invest in a better life for yourself, just like I hope my investments will give me.